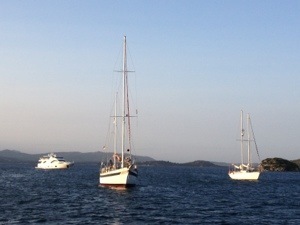 Recovered from our night sail, it was time to “nip around” to Porto Vecchio, some 10 nm away. The Meteo Marine smartphone app promised us wind force 2-3 variable: usually code for “motor all the way”. What we got was wind force 5, gusting 6, on the nose (i.e. blowing straight at us). So our gentle hop turned into four hours of rufty-tufty sailing, tacking into the wind with two reefs in our mainsail and bouncing over a moderate swell. This was lots of fun, but hard work after our all-nighter. Nimrod took it all in her stride and never had us feeling anything other than safe and in control. 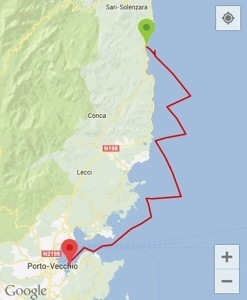 Porto Vecchio is a large natural harbour with lots of cute anchorages, but the force five did not abate and so our main concern was to find somewhere with good holding for the anchor and lots of room to swing on a decent length of chain. We ended up to the south of the commercial port; much more picturesque than it sounds, lovely views of sympathetically developed holiday home running up a wooded hillside. The force five blew until late in the evening but our anchor dug fast and we were all set. We are still talking about the weather forecast: stunningly wrong, and leaving us wondering how 12 hours of 25-30 knot wind could be invisible to the forecasters. Too windy for a barbecue so Jo cooked us a hearty chili con carne, accompanied by some very tasty Corsican red wine. Yum yum. This morning, Liz, Graham and Michael took baby Nimrod over to the town marina, and walked up the very steep hill to the old town. Wonderful views from tiny streets over the expanse of harbour and salt pans coupled with 16th C Geonese stone architecture make it a pretty spot, but almost every building is now a restaurant, boutique or souvenir shop. It will take a prodigious number of visitors to keep them all going. The wind having now vanished, this afternoon saw us motoring the 15 miles around to La Rondinara, a beautifully sheltered 270 degree bay with beaches and crystal clear water. Last time Jo and Liz were here there were only Nimrod and one other boat, but that was October. Today there must be 20 yachts but it’s still a super spot, surrounded by sandy beaches and green hills. The water is lovely, clear turquoise but with a few too many purple jellyfish to allow completely free swimming. Graham swam ashore but had a couple of near misses. Tonight is perfect for a barbecue and Jo has just slung her sausages on the charcoal grill. Sizzle-icious. A quick note about Nimrod: how nice to spend time aboard such a well-equipped, well-loved and competent yacht – compared with the somewhat soulless plastic tubs that are what we usually charter in the Med. Jo & Liz have clearly put a lot of thought and time into sorting her and making her homely. 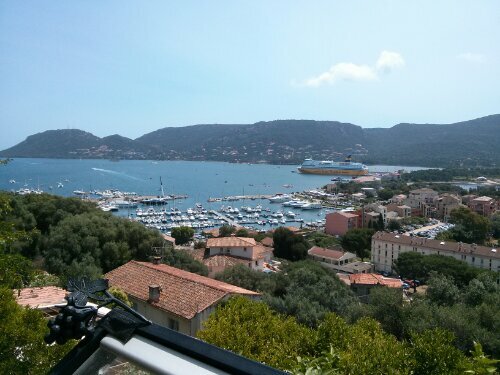 Pictures below of our track yesterday, the anchorage at Porto Vecchio and a view of the old town from Nimmie. 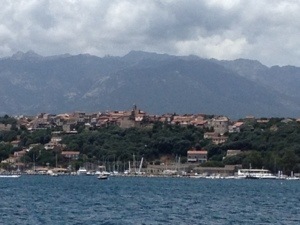 View of our anchorage from Porto Vecchio. 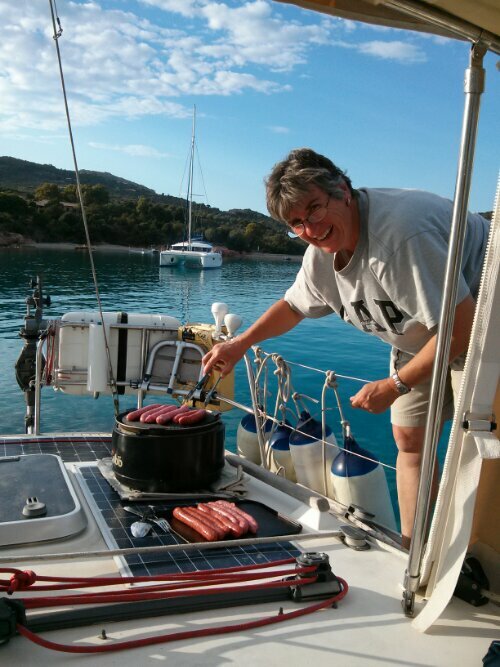 Jo, queen of the BBQ aboard Nimrod at La Rondinara. You two reefing? It must have been lively!!! !